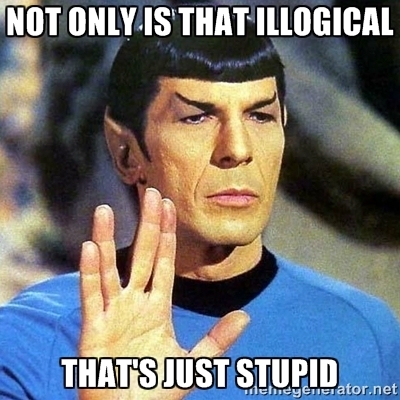 In case you can’t tell, I’m being sarcastic! 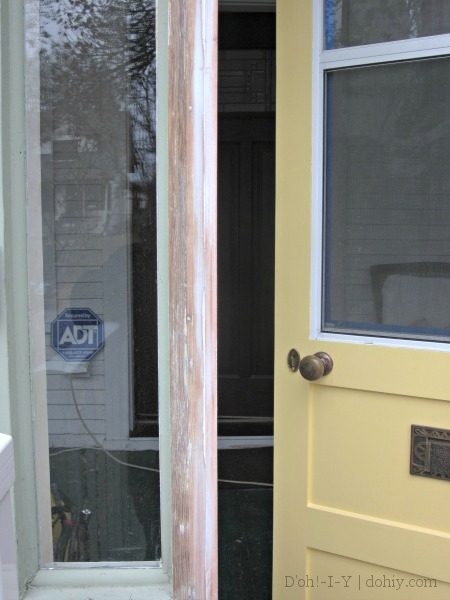 Earlier this year, we bought a new storm door and prepped it for hanging. The Kev painted the door while I was gallivanting with ghosts in San Francisco. We chose an oil enamel for the exterior side, so we took some time to get that smooth and fully cured before installation (more about the exterior paint another time). We knew that the door frame would take some sanding and paint touch-ups, so we needed to get moving before the weather got too cold to paint. 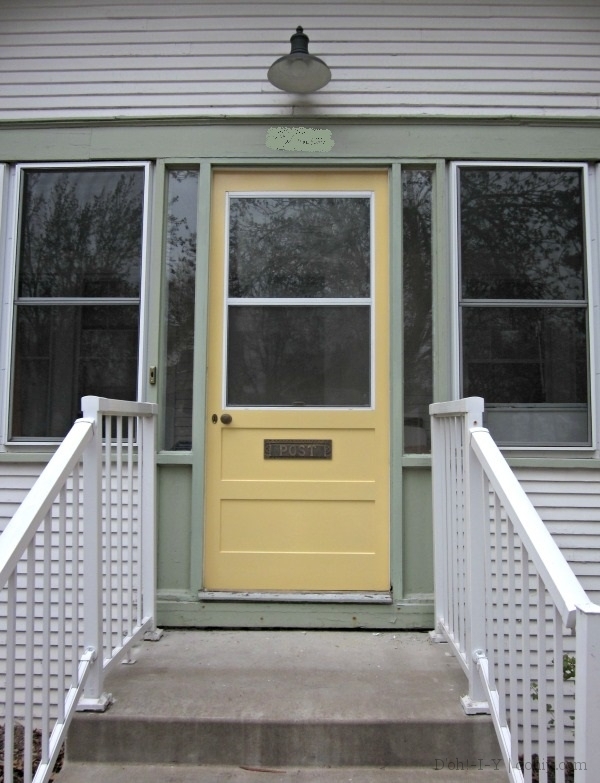 The existing storm door was one of those vinyl units with trim that attaches over the door frame. 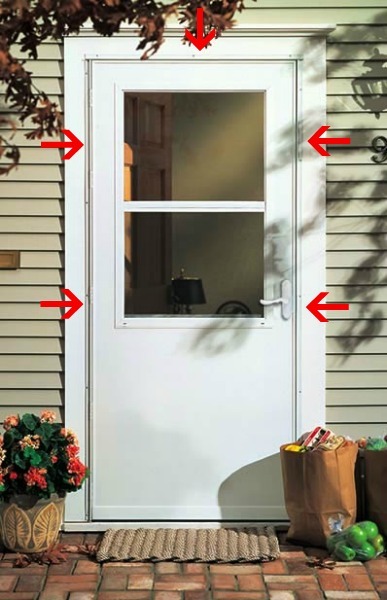 The strip around the edge is an angled trim piece that screws into and covers the edge of the door frame and contains the hinge, latch and weatherstripping (via). 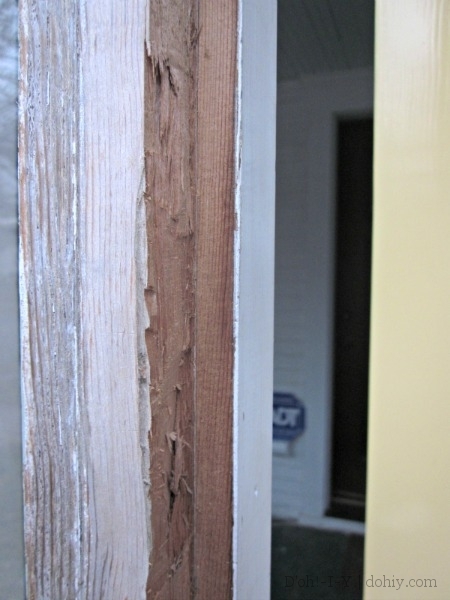 Under the storm door trim, the frame had been packed off about a half-inch on one side, presumably to help fit the door. Fair enough. What’s completely bizarre, though, is that SOMEONE hacked away at the other side of the frame to increase the opening by the SAME AMOUNT THAT IT WAS REDUCED ON THE OTHER SIDE. D’ooooooooooooh! Before sanding and painting, we had to cover up that delightful mess. Kev cut down a piece of wood and nailed it in place. I sanded the frame, and caulked the gap. Rebuilding (and painting) the door frame properly. Replacing the stoop railings (they look ok here; they are not ok). Progress! Could have been more progress if the former owners weren’t trying to thwart us. What were they thinking?! But I should think more positively — if this place hadn’t been owned by dopes at some point, we wouldn’t have been able to afford it! 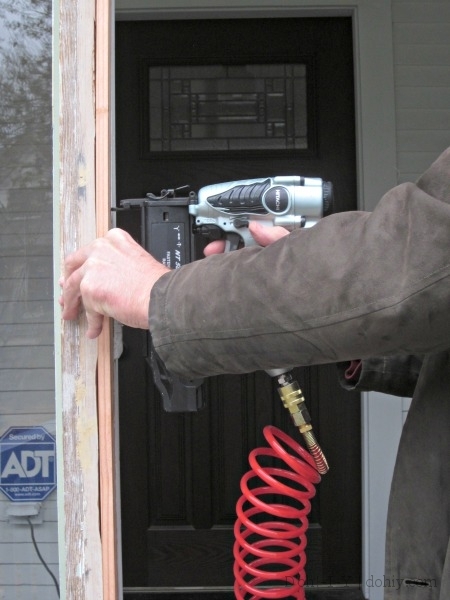 This entry was posted in D'oh!, Porch, Repair & Maintenance, Windows & Doors and tagged assessing damage to door frame, hanging wood storm door, installing storm door, repairing door frame. Bookmark the permalink. 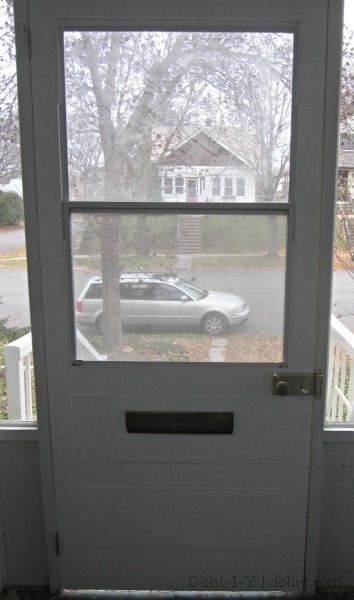 Really like the “Post” hardware on the screen door. Sooo much more memorable than either “Letters” or “Mail”, which although accurate, applicable and more than acceptable, the “Post” gives the slot an international flair – cool! It’s a little detail that makes a stylish impact.